The latest annual Robert Walters Salary Survey revealed that Malaysia has experienced steady hiring activity in 2017. In fact, candidates with high potential or niche skills can expect increments* of between 25-30% when they move jobs in 2018. HR professionals can expect up to 20% salary increases. Accounting and finance professionals can expect up to 20% salary increments. Salary increment for sales and marketing roles in FMCG and the industrial sector remained at between 15-20% in 2017 – these levels expected to continue in 2018. 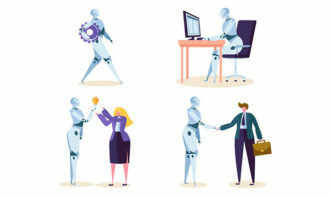 “Employees are increasingly looking for greater engagement with their organisations, and hiring managers will need to facilitate a higher level of workforce engagement to retain talent,” she added. In fact, the findings showed that companies had offered salary hikes of 15- 20% to attract the right talent in 2017 and this is expected to continue in 2018. 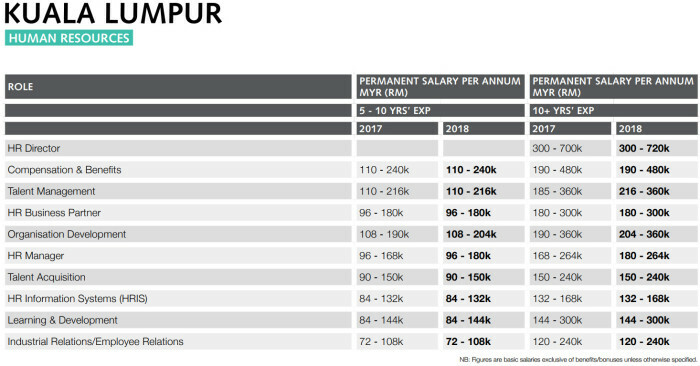 On that note, HR directors in KL can expect an annual salary of RM300k – RM720k next year. However, HR directors in Penang can expect an annual salary of RM168k – 456k. 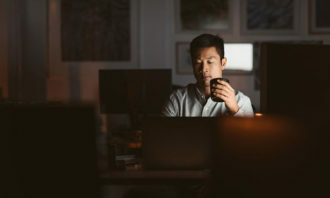 Hiring demand for accounting and finance professionals was modest this year; as companies focused on streamlining costs and outsourcing accounting functions. Most hiring activity was for replacement roles, with many organisations preferring to promote internally before considering external candidates. Meanwhile, more organisations will be looking to automate key finance processes in 2018. 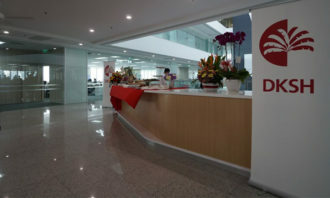 This will allow employees to concentrate on activities that add value, such as strategic planning, business partnership and business analysis. 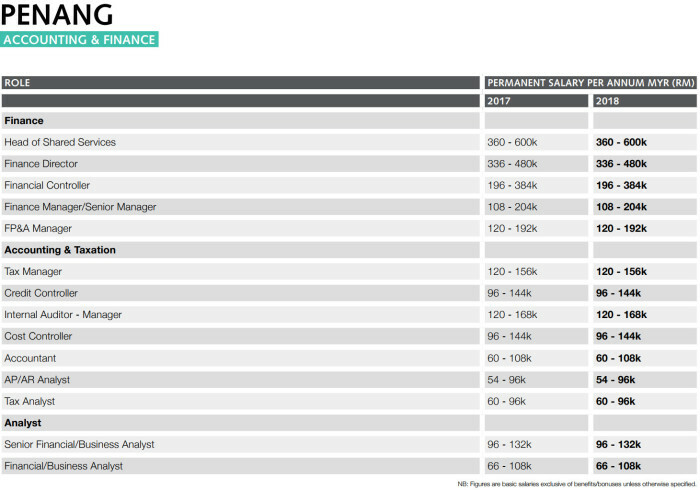 According to the report, salary growth varied in 2017. Professionals with unique skill sets and those who were pursued by multiple organisations could negotiate decent increments of more than 20%. On average, internal increments ranged from 3-5%, while people who changed jobs received raises of 15%. On that note, salary increases of 15- 20% expected to remain the norm in 2018. 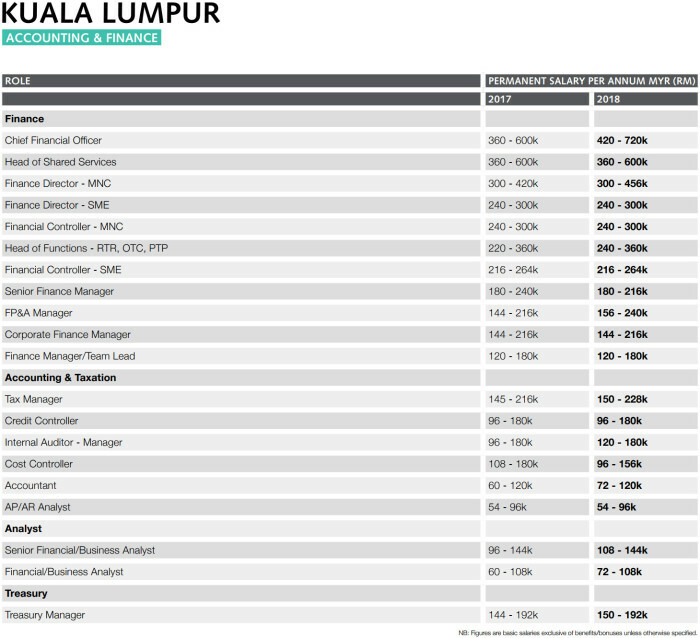 In Kuala Lumpur (KL), accounting and finance CFOs can expect to earn an annual salary of RM420k – RM720k. Meanwhile, finance directors can expect an annual salary of RM300k – RM456k (for MNCs), and RM240k – RM300K (for SMEs). In comparison, finance directors in Penang can expect an annual salary of RM336k – RM480k. There was strong demand this year in Kuala Lumpur for sales and marketing professionals in the e-commerce, retail and industrial sectors. As online spending continued to grow for personal care, fashion, beauty and fresh food products; candidates with experience in merchandising and digital marketing were highly sought after. Employers who focus on finding the right cultural fit will reap the benefits in staff retention. Additionally, transparency and clear communication on potential career progression will have a significant impact on employees’ decisions to stay or leave, offering opportunities to move vertically or laterally. According to the report, candidates for niche positions, or with specific skill sets in the professional services and digital industries, commanded salary hikes of up to 25%. On the other hand, the salary increment for sales and marketing roles in FMCG and the industrial sector remained at between 15-20% in 2017 – these levels are expected to continue in 2018. On that note, managing directors can expect an annual salary of RM360k – RM600k (consumer) and RM360K – RM550K (industrial) – as per the report. Sales directors can expect an annual salary of RM300K – RM504K (consumer) and RM240K – RM360K (industrial) annually. Meanwhile, marketing directors are expected to earn RM312 – 480K (consumer) and RM240 – RM360K (industrial) annually. In fact, close to half (45%) feel stagnant or stuck in their current role, while 43% feel like their organisation only cares for p..